In KING ARTHUR’S VERY GREAT GRANDSON, Henry Alfred Grummorson, a “knight of King Arthur’s blood,” wants nothing more than to be a fighter. He doesn’t just want to pretend to fight. He wants to be aggressive and powerful. His problem is he can’t get anyone to fight with him. He wants “… a struggle of arms, a test of might and courage!” He was “… determined to have a battle, come what may.” But, when Henry gives in to playing a friendly game with a monster he learns the benefits of friendship. How many times have you seen this at home? One of the kids, you or another adult in the house seems to want to pick a fight. We have all both felt it and experienced it. There are so many possible explanations. Pent up emotions from things that happened away from home that day (at school or work, for example) need to be dealt with – it’s like letting steam escape from a tea kettle. Sometimes this even gets directed at the pets in the house – Buddy is mean to the dog because he wasn’t able to stand up for himself with someone at school. It’s the way a person has learned to get attention – even bad attention is better than no attention for a human being. See “Quality Time” up in the attic. A person has saved up “gripes” that she hasn’t talked about or dealt with over many days, weeks or even months. The gripes start coming out in all sorts of ways that may or may not be really connected to the original gripe. I remember these times well in my household. I would be overly careful and “walk on eggs” to avoid any conflict because I knew it would end up in a big fight or I did just the opposite. I would get aggressive too and go ahead and have the fight to get it over with. Anything we can do to help children recognize these types of situations will help them learn to get along well with others. Children can understand that Mommy or Daddy needs time alone because they are upset about something. Children can learn to sense their own “mean-feeling,” “want-to-fight” feelings inside of them. 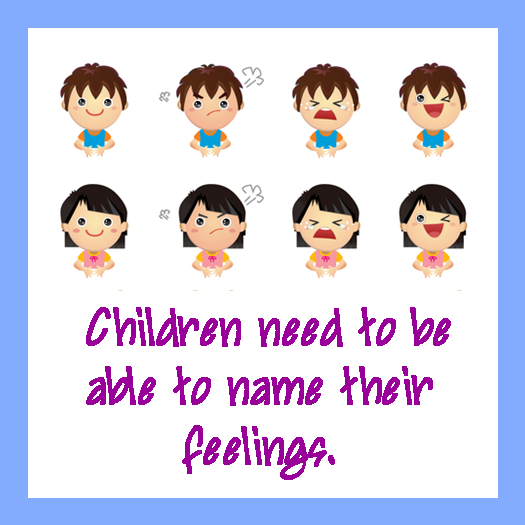 They can be taught to name their feelings and talk about them. They can learn ways to control their feelings and to use their brains to think what to do even when they are mad or sad or happy or scared. At the earliest ages, you can start with pictures of faces that show these emotions and play games with children that will help them use pictures to recognize all sorts of feelings. Once children can name things they have another way to deal with what happens in their lives. They won’t have to only cry, whine, hit, bite, or use their hurtful muscles. They will be able to explain, talk, ask, plead, yell, etc. – words give them another way to release the steam. However, words are not usually enough to get feelings out of your system. Other acceptable physical ways that don’t hurt things or people are also necessary. Children can’t usually figure those ways out for themselves. You need to show them. Give them something they can hit and beat on (pillows, drums, a bat and ball, a football to kick, etc.). Give them opportunities to run, lift and climb in order to use physical energy. Oh, and by the way, remember that girls experience aggression too. It’s not just a boy-thing. You can begin to see aggression in children at around eighteen months old. At first, it is all about expressing the feelings – being mad, frustrated, scared. They are testing how adults will react to their behavior. At around three-years-old they begin to show the aggression toward other people. They are trying out how they want to connect with the people in their world. They are mostly thinking, “What do I have to do to get my own way?” But, from here on out, all the way through their teens, what happens when they are aggressive or kind, mean or helpful or hesitant or adventuresome is what shapes the type of person they will become – bullies, kind caretakers, risk takers, problem solvers, loners, people lovers, etc. Henry experiences this in the story. He learned what happened – how others responded when he was aggressive and when he was friendly. He decided he liked friendship. 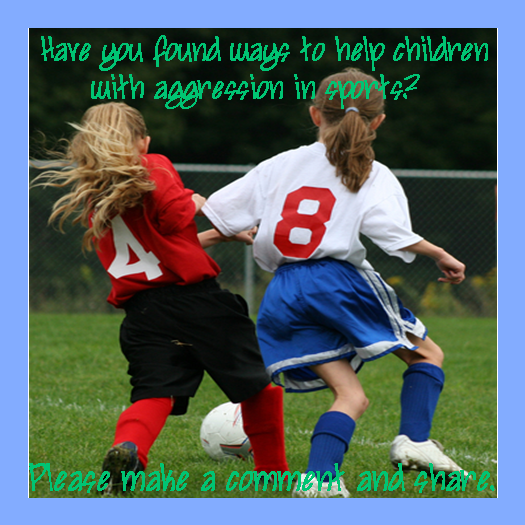 I’m reluctant to talk about this aspect of aggression because it is so hard to figure out how kids can learn to use the aggression necessary in a sport without letting them become convinced that aggression is the most successful way to deal with other people. I wish more coaches and sports-parents would take on the challenge of helping their athletes learn when and how to turn on the aggression and when and how to turn it off. This is not an easy skill, but is more important to your child than all of their sports accomplishments. You can pick up any newspaper or magazine or watch any sports program on TV and see stories about great athletes that have destroyed their lives and their sports careers because they did not learn to manage their aggression off the field. It is the athletes that can turn the aggression off that are the ones that become great people and the ones other athletes want to play against and respect highly whether they win or lose any given contest. Decide: Each action causes a reaction. Practice: Pick out one thing you like about yourself and make sure you show that off at least five times today. For example, if you like that you are a helpful person, keep track of five helpful things you do today, no matter how large or small. Write down how others responded to your acts of helpfulness. Share with a child how other people responded to you. Talk about why people may have had the response they did – even those that didn’t respond at all or didn’t respond well. Today’s Decide and Practice daily parenting tip was inspired by our featured picture book, KING ARTHUR’S VERY GREAT GRANDSON. Read the book to a child in your life each day as a reminder of what you are deciding and practicing that day. This entry was posted in Developmental Stages, Feelings and tagged aggression, anger, attention, competition, feelings, who I am. Bookmark the permalink.